I have been working on a new airplane lately and just finished it the other night. With no wind yesterday morning I decided to have the test flight. It flew great. The only adjustment needed was to dial down the expo on the elevator as it was way too touchy in the middle. It was designed for a 125 sized engine but I squeezed in a Saito 150 so the vertical performance is endless. I was able to hover it at about 1/3 throttle. Thanks to Scott for helping out. Here he is trying to cut his finger off. After wiping down the plane and getting it back home, I ate some lunch and went to set up Terry's glider for a flight. I am flying this wing as a loner until my new T2C arrives from Wills Wing. It should get here in about 2 more weeks and I can't wait. I mounted my Nikon camera to a boom on my downtube and tried to capture the beauty of the fall leaves here at the flightpark. On the first flight I set up the camera, tested it, then took off for a 30+ minute flight taking a lot of pictures only to land and realize that the camera had turned itself off and I had NONE. I messed with the settings until I figured out the problem and then towed back up. This time the flight was quite a bit shorter but at least the camera worked. It's hard to tell but I don't think the leaves have peaked here yet. I plan on flying again today and I want to try a mount on the wing where the side-wire goes in. I have been busy this week carving and sanding wood in the shop. The past two weeks of hang gliding served as an inspiration I guess and I have been shaping some wings. The raffle that helped me get to Arizona was a great success. Big thanks to everyone who helped out. Congrats to James on winning the sculpture. A lot of people had kind words to say about my art and I even scored a few orders that I have almost filled. 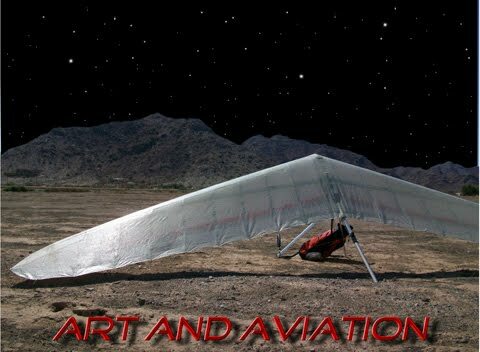 So my new plan is to make some hang-gliding sculptures and advertise here and on the Oz Report. Four of them are getting stain right now and I have ideas for others. This one is about 1 foot tall. It is made of canarywood, mahogony, purple heart, and walnut. This one is about 15 inches tall and is made of mahogony and ambrosia maple. I got back from Arizona and went straight up to Henson Gap for the annual Team Challenge Competition. This is a very unique comp and is priceless for the average pilot learning to go XC. It is also a great introduction into hang-gliding competition. When I pulled in the drive at launch, there was a group of 10-15 pilots walking around with their GPS's simulating a route. Terrific mentors like Dennis Pagen, Mike Barber, Ollie Gregory, Tom Lanning, and more shared their knowledge and filled the heads of the hungry pilots. Aside from the GPS course, there were seminars on weather, thermaling, XC flying, launching, landing, and much more. I missed the first couple of days but understand pilots had great flights on Sunday with many "C" pilots in goal. Tuesday was blown out but then Wednesday was launchable. Light lift made things difficult. I found a climb over the 111 overlook that took me to 1,500ft over launch. I was a "free flyer" during the week and found it a nice change of pace from my previous week's racing in AZ. Thursday the wind was forecast S to SW so we decided to go to Whitwell to launch. I wanted to launch early because I was afraid of the winds going more SW later; not good for Whitwell. Soon after launch and heading north, I found an ugly, broken climb that finally turned on over the ridge. This took me up to about 2,000ft over launch where I could cruise around. Turns out that thermal stayed there all day. Anytime I got low from searching around, I would run back there and get up again. It's fun when it's predictable. Some competitors made it down the valley and some went to land at the church. Overall, everyone had great landings. Nice job Fly-n-Bryon for making goal! The next two days were called for weather. Friday it rained a bit and Saturday was blown out. Saturday night we had a party with DJ, karaoke, BBQ dinner, beer, awards, and tons of fun. Ricker came through with amazing help from sponsers and had many prizes to give out. Nobody left empty handed. So, another good Team Challenge went down. It's hard to believe that these work so well, especially with no meet director. It takes many people and a lot of time to get things ready for the week, but I really appreciate Ollie Gregory and the tremendous amount of volunteer work he does for the comp. He is clearly the grease in the works.